Belinda Merceron is a Haitian-American International Affairs consultant, author, and entrepreneur. She posses a Master of Arts degree in International Affairs from The New School Graduate Program in International Affairs. Belinda holds a Bachelor of Arts from The University of Massachusetts- Lowell in Pre-Law. Belinda has interned and volunteered for several international organizations and civil service organizations who focus on combatting Human Traffic, racial, gender and economical inequalities. She has interned for the likes of the United Nations and ECPAT-USA. 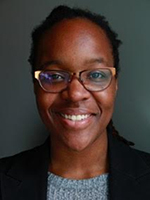 Belinda is passionate about improving the relations of her native country of Haiti with the world; Belinda has several scholarly articles written on Haiti and the region of Latin America and the Caribbean. Belinda also has her first book published on Gentrification. Belinda is an active member of her diverse Caribbean community and contributes in many ways. Belinda is currently the Human Resources Manager at NAAHP.